Blue-green algae plays a very important part in my holistic healing practice. The bluegreen algae I have been using for over 20 years comes from Klamath Lake in Oregon. It is manufactured by New Earth and distributed through network marketing. It is very high in chlorophyll, beta-carotene, vitamin B-12, amino acids, vitamins and minerals. I trust this algae to give the body the nutrition it needs to heal properly. From previous newsletters, you know the importance I place on whole foods, and that I am not a fan of synthetic or formulated supplements. The algae is a whole food that is enzymatically active and nutrient dense. I am not aware of any other product like it on the market. The freeze drying process that New Earth uses not only protects the amino acid and vitamin content, but the enzymes as well. The enzymes are critical. Most horse owners realize how much better horses do on natural pasture than hay. Hay does not have enzymes and the heat drying process causes even good hay to lose much of its vitamin content fast. Feeding the New Earth algae is as close as you can come to having your horse on pasture year round. Of all the benefits I have seen from the algae, the improvement in hoof quality is probably the most dramatic. I have always believed that good hooves come from within, but have been frustrated with poor results feeding most hoof supplements. I noticed on myself that within a few weeks of starting on the algae, my fingernails got tougher. I didn’t even own a nail trimmer as my nails had broken long before they needed trimming. Now I have to trim them regularly. The same is true for hooves, they grow faster and are much tougher. I suspect it is the high trace mineral content of the algae that accounts for this. The volcanic ash sediment in Klamath Lake is 35 feet deep and the algae feeds on this mineral-rich soil. Imagine what our grass would be like if it grew in 35 feet of mineral-rich topsoil. I have also noticed that horses on algae have better attitudes and are easier to train. Scientific studies on children show increased focus and concentration when eating bluegreen algae. As a matter of fact, the founder of New Earth, Daryl Kollman, discovered this algae in a search for a food that would help children learn more easily. Several well known experts in the field of attention deficit/hyperactivity disorders strongly recommend New Earth products for these conditions. The amino acid content in the algae supplies the body with the building blocks for neuropeptides. A deficiency of these important chemicals not only affects focus and learning, but can cause depression as well. The algae seems to help horses in heavy competition maintain a positive attitude and competitive edge. The vitamin content of the algae helps horses maintain beautiful coats and healthy, shiny eyes. Vitamin A is often inadequate in horse rations. The algae is very high in beta-carotene, which is the precursor of vitamin A. Beta-carotene is high in forages but deteriorates rapidly in hay. Beta-carotene should definitely be supplemented if your horse does not have regular access to pasture. Vitamin A deficiencies can affect the eyes, skin, bones, and reproductive system. Mares on algae get in foal easily and have very smooth deliveries. The cholorophyll in the algae helps detoxify the body. Cholorophyll is high in fresh grass but low in hay. Once again, the algae fills the gap for horses without access to pasture. Another benefit I see is healthy immune systems. Now double-blind research out of Canada confirms that the algae stimulates the immune system to seek out and remove virally infected and cancerous cells. I have had a few people ask me if the algae is toxic. There is evidently quite a bit of misinformation about this product. I can say without a doubt that it is safe. I have personally been eating it for many years and am getting healthier each year. I have given it to all imaginable animals from parakeets to elephants. I have given it to one-day-old foals and my own 38-year-old mare. I have used very small and very large amounts. I have studied all the quality and safety testing literature about the New Earth products. I have been to, flown over, driven around and sailed on Klamath Lake. I have seen where and how the algae is harvested and processed. I am convinced it is safe. Perhaps another question needs to be asked, though: Is the algae right for everyone? No. It is a food and everyone handles certain foods differently. Horses are the same. Some do well on alfalfa, but others get hyper or perhaps develop loose manure. As with any new dietary ingredient, the algae should be started in small amounts such as 1/2 to 1 tsp/day mixed with the regular grain. If your horse refuses this, cut back even more. If he still refuses, it may not be the right food for your horse. I think taste is a very important sense to tell us what our bodies need. For instance, your horse may drink water with electrolytes free choice if he is sweating heavily, but refuse it all other times. I believe we can trust the horse’s instinct in many cases with supplements, assuming they are not artificially flavored. Once your horse has become used to the taste of the algae, you can increase the amounts to fit his needs. Most do well on 1 tsp/day for maintainence. Remember this product is 97% absorbed, so it does not take much. 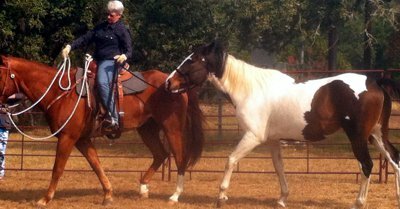 Thoroughbreds may need significantly more, especially if they have bad feet and are hard keepers. To get maximum benefit, the algae should be fed twice a day on a regular basis. It is very economical. Your horse will love you more, especially if you take it too. Functional foods such as probiotics, omega 3 fatty acids, antioxidants, CoQ10 and bluegreen algae support whole food nutrition. Algae provides a wide range of natural vitamins, minerals and amino acids, as well as free-radical scavengers like beta carotene. This area is devoted to education about and consumer support for New Earth’s superior Bluegreen algae nutritional products.